Recently things have been fairly quiet, for me at least, in the world of Massively Multiplayer Online games. That looks as if it is changing. My first MMO. What an experience it was! It certainly felt ‘massive’ – and I hadn’t even got off my start planet of Tatooine at that point. It was undoubtedly ‘multiplayer’ and clearly ‘online’. So, there I was not knowing a thing about the game (I didn’t even have a manual as this was a downloaded trial). All I had was a green R2 unit as a friendly guide and an incredible learning curve ahead of me. The performance wasn’t great, especially around the famous cantina in Mos Eisley – the game was probably at its height of popularity at this point, all those player characters running around really pushed my machine to its limits. It was easy to see why it was popular. I was in _the_ cantina! The funny band were there, playing their odd jazz music we all know so well. Imperial Stormtroopers made their presence known to all. Dozens of players were in the cantina dancing, playing musical instruments or watching others do so. The place was awash with chatter. The place was alive. Exploration was what I wanted. My first instinct was to become a Bounty Hunter – it was the obvious choice for a character called Tonb Terak. The skill system was impressively complicated to my newbie eyes. Bounty Hunter was some kind of elite profession, before I could qualify for it I needed to have skills in scout and hand guns (as I recall). Those were both starter professions, so I took them both. In fact I had enough skill points spare to take pretty much all the starting professions – I could drop some later when I needed the points for higher level skills. It was the scout and pistols skill that really got my exploration going, though. The little green droid told me to go out to the edge of Mos Eisley and kill some Womp Rats or similar vermin. They were tougher than they looked. I died. Fortunately I had a ‘get out of death free’ card and woke up in the Mos Eisley cloning centre. I had some injuries nonetheless, some battle fatigue and physical wounds. I went off to the medical centre where several players with medical skills were to be found. They patched me up in no time and I tipped them a few credits (I didn’t have many yet). It was good fun ‘roleplaying’ it. I told the medic how some Womp Rat got the better of me, how I woke up dead in the cloner but was feeling much better now. You had to be there! Then it was off to the cantina to watch some Twi’lek woman gyrating to the music to work off my battle fatigue. Thank goodness I had found some SWG websites and forums to explain these things to me! A little bit later I had triumphed and the little green droid taught me how to harvest the fallen Womp Rats for hide, meat or bone. My green R2 friend then taught me how to make a little camp (with tent, fire and a fold up chair or two) out of some hide and bone. Even out in the wilds I could be at home! At this point I hadn’t even left the area around Mos Eisley. I didn’t have enough money for the shuttle (let alone the ships at the space port that will take me to a different world) and certainly not the 10,000 or so credits I needed for a speeder. I had a mission, from one of the convenient mission terminals dotted around Mos Eisley, to go somewhere far away on the map. I had no choice but to walk. What a walk it was! Just beyond viewing distance of Mos Eisley I came across a burning Jawa Sandcrawler. Wow – that’s the one from the original Star Wars film, I thought! Things got hairy after that. The creatures I came across away from Mos Eisley looked a lot tougher than me. Keeping an eye on my mini-map I did my best to steer clear of them. When I heard the ‘combat music’ kick in I performed a Burst Run to get away. The trek took two to three hours, I think. A simple delivery mission. It was a massive world. I made my way back, still on foot. This time I left the character to walk back without much help from me, setting him to autorun. Meanwhile I kept only half an eye on that as I pulled my laptop out and surfed the Internet for SWG information. What I really needed was money and I wasn’t making it very quickly at this rate. Only a few days into my trial account and I was already on eBay buying 2 million credits! It was about £20 and well worth the money (though there was an unfortunate incident at first where I didn’t realise trial accounts could have a maximum of 50,000 credits – whoops 1.95 million flushed away.) Quickly signing up properly for SWG and buying another 2 million sorted out my in-game finances for good (I never got close to running out of money after that, in fact my character has over 17 million now after some very profitable hunting contracts for other players…) The world was my oyster now and my exploration and appreciation for the game had only begun. Nothing lasts forever, though. The challenging learning curve leveled out after a few months and there seemed little left to do. I won’t even go into the mess that Sony Online Entertainment made of the game with their constant revamping and dumbing down. 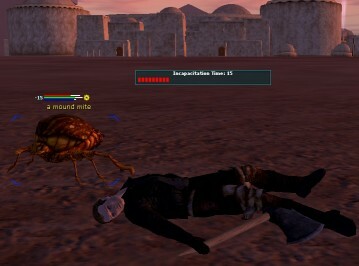 Yes, I’m still rather bitter about what they did to SWG but the truth is I’d probably played it to death by that point anyway. There’s nothing like your first time and I can never replicate those first experiences of an MMO, not even if SOE reset SWG to July 2004 status and I started over. MMOs didn’t stop there for me, though. I then did a 14 day trail of Eve Online. Eve is a space trading game very much like the old Elite computer game from 1984, only much bigger, much more ‘realistic’ and filled with tens of thousands of other people. I loved Elite back in the day and it sounded like the perfect MMO for me. It didn’t immediately grab me, though. 14 days isn’t really enough. I’ve got a retail CD somewhere with a month subscription included – I really must give it a better try at some stage. That was November 27 2004 – 9 December 2004. I did actually try to convert my trial account into a live account using the retail CD but, unfortunately, their website wasn’t actually able to accept the CD code anymore. Instead I’d have to buy a code on their website for €19.99. I emailed them and they said I should create a new account using the CD key (which was still possible, just not to convert from a trial account) and they’d transfer my trial character over if I submit a request to their customer support people. That all sounded like too much trouble so I let it slide. I couldn’t just leave my Tonb Terak character to fester away on a discarded trial account while I used a different character on a live account! Maybe someday I will return to Eve. Next it was the City of Heroes Beta. More on that next time. Yes, this is all leading somewhere (perhaps). The potential parallels between SWG and my newest Beta experience – Vanguard: Saga of Heroes. As I said, though, more on that next time! Well, that’s it for another year. It always amazes me how quickly Christmas/New Year whiz by. I’m now in my second week back at work and things are starting to settle into place again, as if there was no holiday at all. Now is probably a good time to quickly look back on what happened, before it vanishes completely. I had a lot of Wii and Doctor Who over ‘the festive period’. By Wii I mean a lot of people playing with my Wii, it doing various tours over that time (to the point where I’d given up setting it back up at home, instead leaving it in a bag ready for the next excursion). By Doctor Who I mean, of course, the Christmas Day Confidential, The Runaway Bride and Cardiff Concert, plus Radio 7’s new 8th Doctor story (The Blood of the Daleks), the Sarah Jane Adventures and the Torchwood finale. That’s a lot of Doctor Who. Oh, and there was 3 hours of something on Radio 1 on Christmas Day too, of which I heard only snippets of David Tennant being interviewed between pop songs (I think I’ve got it recorded somewhere, I’ll have to find some time to listen at some point, maybe). A good time was had, if far too quick (no comments back there..!) To be honest I was a little disappointed with the TV offerings this Christmas. I had much hope for the likes of The Ruby in the Smoke, The Hogfather and Dracula. They were all okay, not bad and not all that great, either. Also, what is it with this Marc Warren chap?! He’s everywhere! The Hogfather, Dracula and two DVDs of the brilliant BBC series Hustle as Christmas presents (with twelve episodes of this Warren fellow) was a little more than anyone can stomach over such a short period! Hustle, as I say, is a brilliant TV series – don’t be put off by his presence, it really is an ensemble cast and clever and witty to boot. You owe it to yourself to see some of it. Sadly nothing this Christmas came up to that standard for me, not even any of the Doctor Who battalion. I won’t go through a list of all the generous gifts I received this Christmas but I should also mention another great DVD – Dave Gorman’s Googlewhack Adventure. Again, that was also a cut above the new TV that was churned out this winter solstice period. More of Googlewhacks in the future, I suspect. That and hope for the forthcoming TV series coming along in the next few months, such as the new Doctor Who, Life on Mars and another series of Hustle. What’s this end of year really about, though? It’s not TV or computer games. Spending time with friends and family? Yes. There’s more to it than that, though. There’s the whole calendar change business and the thoughts that brings with it. Me, I’ve always tended to look more to the future than the past. Perhaps that’s part of why I like SF so much (or, perhaps, the other way around). I imagine some people look back on the year. I don’t really do that. No, I worry about the future instead. What bad things does the coming year hold? Generally very few in my, so far, fortunate life but that doesn’t stop you thinking about the bad things that could go wrong. Not much of a celebration really! Then there’s the immediate return to work after the all too brief holiday… The tail end of that break is never good! Fortunately the sensations don’t tend to last too long before it’s business as usual. That’s where I am now. That’s both a good and a bad thing – for now I am looking neither forward nor backward! No, that’s not true. I’m looking forward to unpacking my Wii again!